EA Reveals Madden NFL 08 soundtrack - GameSpotting! Posted on June 29, 2007 by MASA. 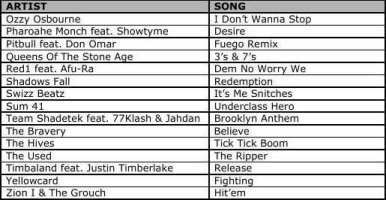 EA Tiburon (the EA studio in Florida), has just released a list of songs to be featured in the newest Madden NFL game that releases this August. This year’s game will be the series 18th game. A random fact about the series is that it has sold 60 million copies, which nets around $2 billion dollars for EA Tiburon Studios. The game is supposed to feature 27 songs, yet EA only gave us 15 songs in the list. Nice counting EA.